There are high hopes for Spanish defender Hector Bellerin at Arsenal. Arsene Wenger recently gave the 18-year-old a brand new contract at the Emirates with the full back signing a four year contract. When Arsenal swooped to pluck yet another youngster from Barcelona back in 2011, most of Europe watched and assumed that Arsene Wenger had found another gem. Just like the signing of Cesc Fabregas from Barcelona, there would be much controversy over Arsenal's pursuit of Bellerin. 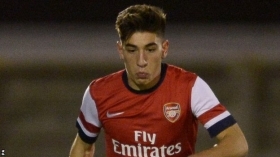 On the 25th of September 2013, Bellerin made his first appearance in Arsenal's first team as he played in the League Cup against West Bromwich Albion. He has since gone on loan to Championship side Watford and is being regularly used there. His loan spell at Vicerage Road is due to expire at the end of the month but according to reports, this will be extended until the end of the season. Bellerin is a talented defender who is comfortable playing anywhere along the back line. The player often admits that his preferred position is at full back and specifically on the right hand side, but he is regularly deployed as a centre back in the Gunners' reserve team. Hector has played for Spain's under 16, 17 and under 19 side. He has been tipped for a bright future by many of Arsenal's coaches and even a potential replacement for current first choice full back Bacary Sagna. Sagna's contract at the Emirates is due to expire at the end of the season and at this point, Arsenal have yet to have found a replacement. Bellerin's most impressive asset is his speed and ball control. His acceleration and dribbling has caught the eye in numerous games and the player is hotly tipped to progress into Arsenal's first team sooner rather than later. Expect to hear more about Bellerin before the end of the season. He will be given a great chance to shine in the Championship.